Hi everyone! Today is the last day of the My Favorite Things June release countdown. This release is absolutely fabulous! The new products will officially be available on the MFT online store in a few hours!!! Yay!!! The new products will officially be available on the MFT online store on June 6th at 9:00 pm EST (= Europe: June 7th at 3:00 am CET). Most of the supplies I used for this project are linked in the link-up tool at the bottom of this post. I combined the sentiment with a formerly released cling stamp called Diagonal Design Background. It matches perfectly. I heat embossed the maze background with WOW! Opaque Bright White Super Fine Embossing Powder and sponged it with Distress inks to create a beautiful rainbow effect. I also heat embossed the sentiment on translucent vellum using the same white powder. I then die cut it with the Sentiment Label Strip die. Very cool card. I do like your background with that sentiment and Luuuuuuuv your colors. 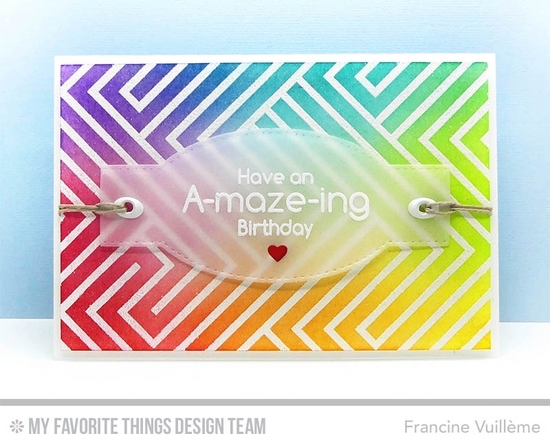 I love how your sentiment pops against all those great colors on your background, Francine! Really fun card! Great card. So wonderful colors and love the transparent sentiment on this graphical background!!! Super card! Love how colorful it is and the layout. What a clever card to use the diagonal design to crate a maze with a greeting on tied down vellum! That background is just gorgeous!! Beautiful card!Love the colors and the design! Rainbow is my FAVORITE color. Thanks sooo much for sharing!